Over the past nine months, we have been listening to the experiences of lower income individuals with identity systems in India, together with the International Institute of Information Technology Bangalore (as a research partner), Storythings and the Langtons (as communication experts), and funded by Omidyar Network. We have conducted 150 interviews across rural and urban sites in Karnataka, New Delhi and surrounding Uttar Pradesh, and Assam. We observed identity-based transactions (such as getting an Aadhaar card, buying a SIM card, being tested for a disability certificate), had a heated radio discussion, and great workshops in Delhi, Bengaluru, Washington DC and Stockholm (at SIF) for input. Our aim was to understand user experiences of identity in a digital world – what do individuals experience, what are the pain points, how can we move towards more inclusive systems which respect privacy, agency and dignity? All these are particularly relevant in India, where Aadhaar is currently a contentious topic. Many of our interviewees spoke of the benefit of ID systems – an Aadhaar card which enabled benefits and services; a ration card which allowed subsidized food, kerosene and medicine. On the other hand, at a time when Aadhaar memes are being shared on how it is effectively compulsory, we asked questions on privacy, exclusion, bias and repercussions for groups such as senior citizens dependent on Aadhaar verification for pensions. These concerns are not unique to Aadhaar or the Indian context of course. There have been quite a few reports on identification exclusion in the United States, including immigrants, those homeless and out of prison in Ohio, the story of Alice Faith Pennington in Texas, and the intermediaries who are trying to help those in a catch 22 situation without IDs. We heard many concerns around all the above. Several women spoke of feeling uncomfortable in “male spaces” and sluggish bureaucracy impacting more on them because of impact on time needed for family care. Men often acted on behalf of women. Non-formal migrants were particularly affected by requirements such as a permanent address, not knowing local networks for help etc. A visually challenged teacher told us about the long process of getting both a blind and disability certificate and that in addition, when he went to get an Aadhaar card, he was pushed about and there was no help. A transgender activist was highly critical of invasive identification for “screening committees” for transgender certificates. Identification processes are not new. But the introduction of networked systems has introduced two major challenges: the huge impact if there are any mistakes; and secondly data is more easily accessible to many more people. Again, this is not unique to India, but the burden of proving you are lies heavily on individuals and impacts even more on those who don’t have time or resources to do so. 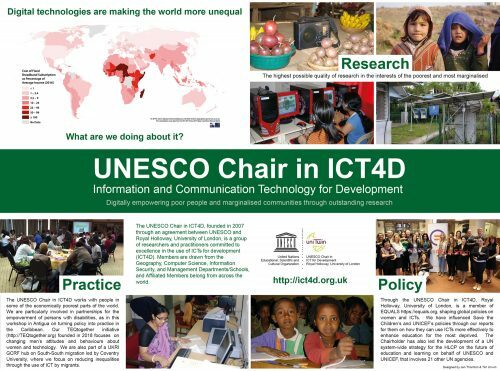 Posted on July 31, 2017 by Endrit KromidhaPosted in ICT4D BriefingsTagged Aadhaar, ICT4D, Identification, Privacy.